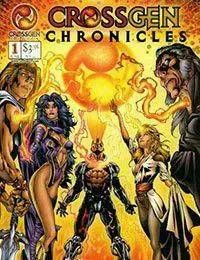 CrossGen Comics bursts onto the scene with a 48-page stand-alone epic that establishes the CrossGen universe and showcases the characters from the core of this universe. The first issue of the quarterly Chronicles series introduces the First, god-like characters whose superiority is suddenly threatened by the appearance of mortals graced with mysterious symbols of power. These Sigil-Bearers will be the stars of CrossGens four monthly titles, all debuting in June. The previous collaborations of Marz (Green Lantern) and Castellini (Marvel vs. DC) have produced some of the most visually stunning stories ever seen, and this promises to top them all! Also included is a wealth of preview material for next months launch of CrossGens exciting regular titles... Mystic, Sigil, Scion, and Meridian.